Club Epicure, a supper club helmed by Masterchef quarter-finalist Alex Parker, has just launched in Winchester. Is this the future of dining in the city? James and Kelly of Winchester Bloggers went along to find out. Yet within a few minutes of entering Club Epicure, these fears evaporated. Chef Alex and his partner Hatty immediately made us feel welcome. The kitchen and dining area were inviting and beautifully presented. As the first guests to arrive, we were offered a preview of the homebrew sweet tea Kombucha, including a look at the fermenting process. We’re pleased to report that it is as tasty as it is unusual! As the guests arrived, you could feel that something special was happening. The other guests were all clearly as intrigued by the supper club concept as us. Each person spoke passionately about food and were open-minded in their approach to what was being served. A great buzz of anticipation filled the room. Thankfully, Alex’s food exceeded even these high expectations. We shared homemade sour dour, hummus and beetroot crips with our fellow diners as we began sharing introductions and stories. After this point, everyone visibly relaxed and the food treats kept on arriving. During the build-up to Club Epicure, Alex had asked diners to offer some ideas built around our favourite foods, a question which we duly answered on Instagram. We were then incredibly flattered when Alex produced a stunning ‘bonus’ dish of slow-cooked beef and mushroom ketchup. 'Winchester Bloggers Beef' was a triumph! The rest of the five-course menu was a stunning. Dish after dish arrived packed with flavour, invention and craft. Hatty was the perfect host, explaining the dishes and checking we had everything we needed. Alex also made regular forays to the table to ask for our feedback. Both Alex and Hatty are clearly very passionate about Club Epicure, proud of the food they serve and keen to develop their ideas. Club Epicure is an amazing addition to Winchester’s already rich dining scene. Value for money, quality and setting were all five star and we will definitely be back for more. With guest numbers limited to 10, we recommend you book early as word of mouth will ensure high demand. The next Club Epicure supper’s take place on October 15th and 19th at 7:30pm. The 19th is already sold out, so if you want to be among the first to experience ClubEpicure, make sure you book now. Thanks again to Hatty and Alex. 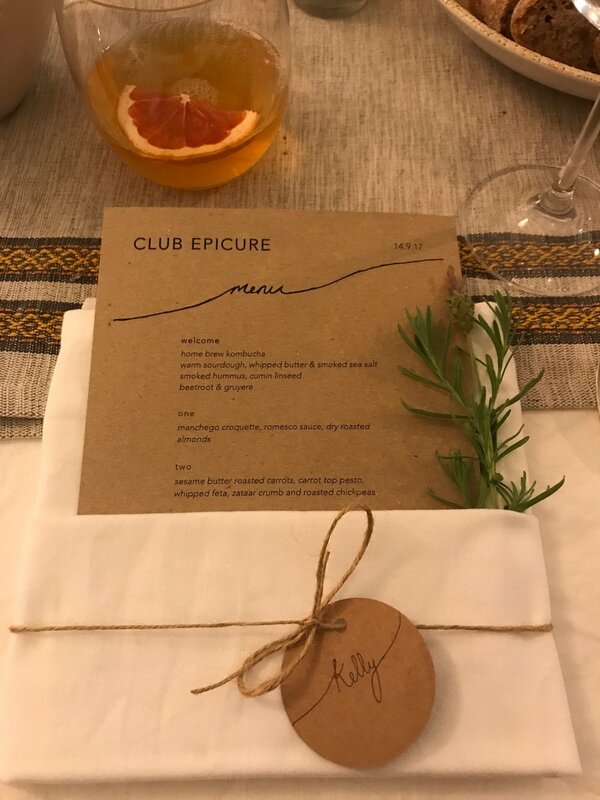 We are privileged to have been part of the first Club Epicure and look forward to attending again. It was a fresh and exciting experience and for that reason, it is certainly part of a very bright future for Winchester dining. After its hugely successful launch Club Epicure returned, this time with two dates to meet demand. We attended on 19th October, arriving to an already bustling supper club - there were 12 guests this time so the atmosphere was even more vibrant. Hatty was her usual welcoming self and we sat down feeling very much at home. We were all keen to see what Alex had in store following his recent trip to India - a so-called 'holiday' which saw him guest cooking for in the highly regarded Magazine Street Kitchen - a task requiring two days of prep. A look at the menu highlighted the influences and we were all looking forward to tucking in. We started with some stunning layered, creamy potatoes topped with crispy chorizo and accompanied by a rich and silky lobster bisque. Not only was it a stunning start, it was billed by Alex as a 'bonus' dish. Then it was onto the menu itself. The cumin roasted beetroot was delightful, with the kefir and tahini flavours showcasing the chef's recent influences. Next was a showstopper: slow cooked butternut squash with mung daal, tamarind, coconut and cavolo nero. The balance of flavours was perfect, highlighting the depth of flavour in the squash - a hugely successful dish. The pork served next was flavoured with gochujang, a roasted pepper popular in the far east that combined a wonderful warming heat with the sweetness of peppers. The fennel and lime slaw, sesame yogurt and smoked onion rounded off this punchy and flavourful course. Finally, we were served a cardamon custard tart with a homemade pear sorbet and pistachio brittle. 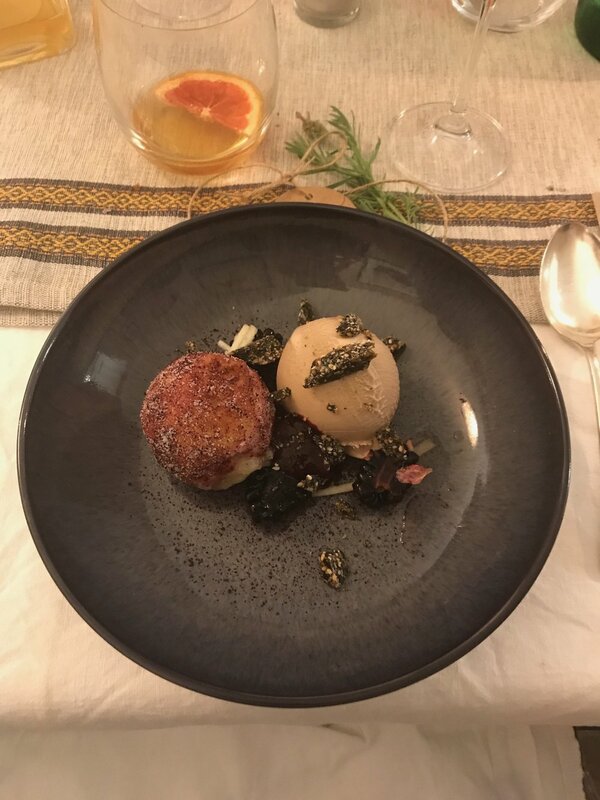 This dish highlighted Alex's ability to combine flavour and ingredients typically found in a savory dish to add a fresh and cleansing element to his already pleasing desserts. One of the highlights of Club Epicure is something you don't often consider when going to dinner: speaking to people you wouldn't ordinarily get a chance to meet. Being sat in such an intimate setting and sharing fantastic food is a great ice breaker, and we had some illuminating conversations with our fellow guests. Highlights included learning about advances in knee replacement technology, the ongoing plight of native Americans, why accountants are rarely trained as accountants and a recommendation to find the Bad Robot while in London docklands. Three new dates have been announced for Club Epicure on 16/17th November and 13th December, full details on our events page. Alex recently spoke to Me MySelf & Ice Cream about the concept of Club Epicure and future plans. Read the interview here.